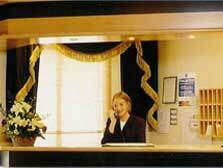 For budget accommodation at its best The Camden DeLuxe Hotel will meet all your requirements. Situated in the heart of Dublin City, a splendid location for exploring everything that Dublin has to offer. St Stephens Green, Grafton Street and Temple Bar are all within walking distance of the hotel. The Camden DeLuxe offers budget accommodation with a good hearty breakfast thrown in to start the day. The old Theatre DeLuxe was renovated to modern standards and is now The Camden Deluxe hotel. It offers 34 up-to-the-minute ensuite bedrooms all equipped with direct dial telephone, television, tea / coffee making facilities and hairdryer. Even though the interior is very modern the exterior is preserved just like it was in 1957 when the old theatre closed down. For the sporty guest the large pool hall can hold up to 150 people and contains 20 pool tables and is very popular with both locals and visitors. For the snooker lover there is a private snooker room as well as fuss ball tables, video games and dartboard. The Picture House restaurant provides an A La Carte menu and a full carvery lunch. The Good Food Café is also very popular. The Picture House Bar is loved for its liveliness, friendliness and fun.